Change the properties of the VM in vSphere Client. Resize the disk space from the guest operating system (OS) in the VM. 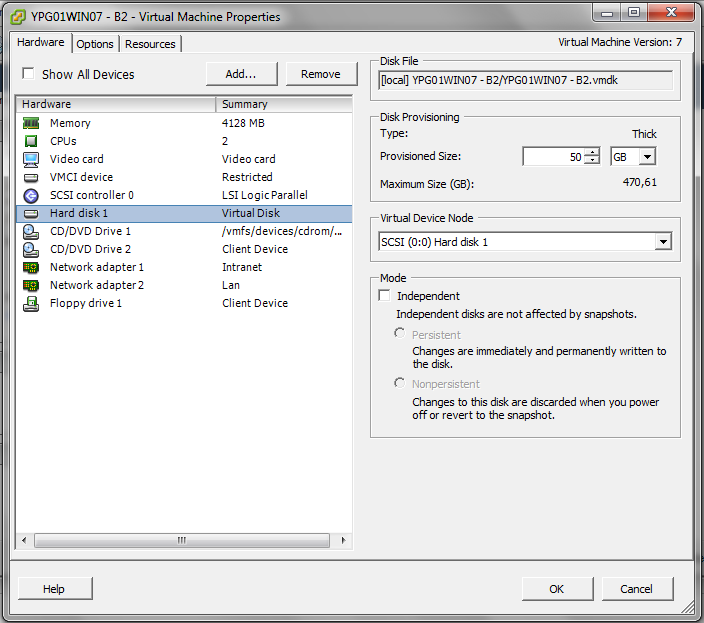 In vSphere Client, edit the properties of the VM using the option “Edit Settings”. In the properties window, select the hard disk to be extended and change its size (“Provisioned Size” option). To check this step, in the guest OS of the VM, verify the unallocated space on the disk. If you are using Windows Server, open the “Management Console” > “Disk Management”. The second step is to resize the disk space from the guest OS in the VM. In Window Server versions, use the Disk Management Tool. In Windows Server 2003 or earlier versions, download Dell’s ExtPart utility from here. Extract it by default in c:\dell\ExtPart and run the executable. Windows Console will be prompted. Enter the volume and the size to expand it. Data recovery is the term used to describe the process of extracting data from a storage device. By storage device I am referring just to the obvious devices such as an internal hard drive, external hard drive, memory sticks, discs and other forms of electronic data storage typically associated with computers, but also the not so obvious devices such as the hard drive in your sky box or the hard drive in your camcorder.